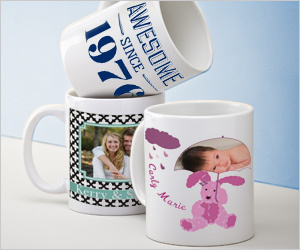 The Coupon Centsation: Vistaprint - Custom Photo Mugs for $6.99 Each! Summer may be coming to an end, but your memories can last a lot longer. Capture your favorite summertime moments with Vistaprint’s $6.99 custom photo mug! These personalized mugs would make a great gift for teachers, family, and friends. To make your gift even sweeter, consider filling it with teacher essentials, chocolate, coffee, or any other treats that will make the recipient thankful that you took the time to customize such a creative (and affordable) gift! In addition to the fun summertime mugs, you can also choose from other designs for holidays, birthdays, and more. If you’re looking for a unique way to promote your business, you can also upload your logo, or browse around Vistaprint’s library for a logo that fits you. With summer nearly behind us, this week’s sale is the perfect time to get shopping underway, so get started now!